Generally, Cisco Aironet 802.11n G2 access points include Cisco Aironet 3600, Aironet 2600, Aironet 1600 Series, Cisco Aironet 700w, 700 Series, and Cisco Aironet 600 Series OfficeExtend. Cisco has true enterprise-class RF technology designed to maximize 802.11n performance. Cisco technologies such as Cisco CleanAir Express, Cisco ClientLink 2.0, and Cisco VideoStream, plus optimized access point radios and antennas, improve performance regardless of where client devices are located. The benefits of deploying Cisco Aironet access points with a Cisco Unified Wireless Network extend from investment protection and future-proofing to better scalability and reliability of the enterprise network. Designed with rapidly evolving mobility needs in mind, Cisco offers several 802.11n-based access points for small and midsized networks. The Cisco Aironet 1600 Series is an entry-level access point with advanced features. With the Aironet 1600 Series, customers can modernize their network to handle today’s explosion of more clients, applications, and bandwidth demands. The Cisco Aironet 700 Series offers a compact dual-radio 802.11n access point ideal for value-minded customers. The Cisco Aironet 1600 Series is an entry-level, enterprise-class 802.11n-based access point designed to address the wireless connectivity needs of small and midsize enterprise networks. • The 1600e model is for RF-challenging indoor environments and requires external dual-band antennas. 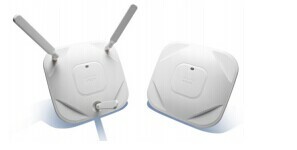 The Cisco Aironet 2600 Series Access Point is BYOD-optimized for connectivity to any client device. Second only to the Cisco Aironet 3600 Series in performance and features, the Cisco Aironet 2600 Series sets the new standard for enterprise wireless technology. This mission-critical access point delivers Cisco’s RF excellence features such as Cisco CleanAir and ClientLink 2.0 technology for any small, medium-sized, and large enterprise network. •The 2600e model is for RF challenging indoor environments and requires external dual-band antennas. The Cisco Aironet 3600 Series Access Point delivers the highest level of 802.11n performance. It is the industry’s first and only 802.11n 4 x 4 MIMO access point with three spatial streams. It offers an expansion capability for emerging technologies such as 802.11ac or advanced services such as a Wireless Security Module or Cisco’s 3G Small Cell Module. The 3600 Series offers better 802.11n coverage and security in dense-client networks that support applications such as HD video streaming. • The Cisco Aironet 3600 Series Access Point also supports Cisco ClientLink 2.0, which optimizes performance for tablets, smartphones, and laptops. Supports standard 802.3af Power over Ethernet (PoE) switches the 3600i model features integrated antennas for typical office deployments. •The 3600e model is for challenging indoor RF environments and supports external dual-band antennas. How to Buy/Choose a Wireless Router for Your Home or Small-business Network?